The Servant of God Paul Yun Ji- chung, a layman, and 123 companions, were killed because of hatred of the faith between 1791 and 1888 . Yesterday, the decree on their martyrdom. The beatification ceremony should take place on August 15. Pope Francis should also be present at the opening day of the Asian Youth Day, on August 13 , whose theme is "Asian Youth! Wake up! The glory of the martyrs shines on you". Vatican City ( AsiaNews) - In all likelihood it will be Francis Pope to beatify the 124 new Korean martyrs. Yesterday, the Pope authorized the Congregation for the Causes of Saints to promulgate the decree confirming the "martyrdom of the Servants of God Paul Yun Ji- chung, layman, and 123 companions, killed in hatred of the faith in Korea between 1791 and in 1888". On his first visit to Korea in 1984, the same Polish Pope canonized the priest, Andrew Kim and 102 other martyrs. The epic of the Korean Martyrs - from 1785 until 1882 more than 10 thousand Catholics were killed, only 10 of whom foreigners - is a source of inspiration and renewal for the Church in Korea that dedicates the month of September to worship and to pilgrimage to the places of martyrdom. Last July a "rosary marathon" was held, asking God to grant the beatification of Paul Yun and his companions. The decree of beatification yesterday makes a visit of Pope Francis to Korea increasingly likely. Sources have told AsiaNews that the beatification should take place on August 15. 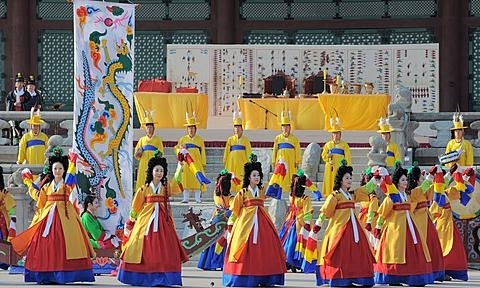 The Pope should be in South Korea from August 13 to celebrate the grand opening Mass of the Asian Youth Day, to be held in Daejon and whose theme will be: "Asian Youth! Wake up! The glory of the martyrs shines of you". In recent months, AsiaNews has presented some of the lives of these witnesses of Christ.